Just as PCBs have successfully managed to pack an increasing amount of power into a smaller space, developers of plug connectors are working to accommodate more power and a higher contact density into smaller, lighter plug connectors. The family-owned British manufacturer, Harwin, relies on Festo automation to safeguard the quality and flexibility of its production using equipment such as the servo press kit YJKP and the compact handling system YXMx. Harwin’s connectors are high quality, reliable and durable and can thus be used in harsh ambient conditions. They do not only fit the bill for customers in industry sectors such as cost-conscious consumer electronics, but also in the ultimate performance seekers such as aerospace, motor sports and the automotive industry, where extreme operating temperatures between –65 and 150°C, as well as severe vibrations, are the order of the day. This means the connectors have to be manufactured to very high standards. The response by Harwin to these market requirements has been to launch the Gecko range of connectors. These advanced connectors have a pin pitch of only 1,25 mm and are half the size and 75% lighter than micro D connectors. Their robust screw connection makes them extremely safe and reliable and able to withstand countless mating operations without damage. The Gecko connector manufacturing process has been continuously refined from an initially manual operation to today’s highly automated solution, capable of producing hundreds of thousands of connectors a year with a wide range of configurations ranging from 4 to 50 pins, and many PCB mounting options. Harwin started developing a new manufacturing line with the aim of making the production of the Gecko series more efficient. Both a high level of automation and a high degree of flexibility were needed to produce differently shaped and sized connectors on one line. “That is why we developed a modular concept together with Festo,” explains Paul McGuinness, operations director at Harwin. 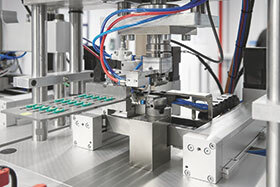 The new assembly lines are built around the servo press kit YJKP and the compact handling system YXMx from Festo. The handling system takes care of the XY movements of the workpiece carriers and the plastic housings assembled in several of the system stations. The servo press kit, which provides easy-to-configure position and force controlled movement along the Z-axis, is used for press-fitting and bending the contact pins. In all stations, the electric and pneumatic drives are each controlled by their own controller together with a valve terminal. “These Festo systems enable maximum standardisation and modularisation, as standard parts are used everywhere. This makes commissioning and maintenance easier,” explains McGuinness. One of the assembly lines for manufacturing the connectors consists of multiple stations for inserting, press-fitting and bending the contact pins. In the first station, the workpiece carriers are equipped with the connector housings, which are positioned using the compact handling system so that the contact pins can be inserted. In the second station, the servo press presses the contact pins into the connector housing. The precision gripper from Festo locates the workpiece carriers while the pins are fitted. The handling system and the servo press kit are also used in the last station for bending the contact pins to the required angle. The CoDeSys software in the controller allows comprehensive control of the servo press profile, providing position and force control throughout the cycle. The application software supplied with the servo press makes programming extremely easy thanks to an intuitive graphical user interface.